Trans-Fuzja is a Polish LGBTQI organisation mostly focused on trans rights. For our appointment “Members’ Monday”, we interviewed today Wiktor Dynarski, President and Executive Director of Trans-Fuzja, in order to get to know better Trans-Fuzja’s main initiatives and activities. 1) Wiktor, what is a very exciting project Trans-Fuzja is currently working on? Together with Lambda Warsaw we currently run a shelter for LGBT people who experienced violence and/or homelessness. It is so far the most ambitious and one of the most rewarding projects that the Foundation has ever worked on. It is especially important, because it is a joint effort of two organizations who have years of expertise in their support work. 2) What is a priority in Trans-Fuzja ‘s agenda? Our organization has two priority work areas – support and advocacy. With support our priority is to create as many support spaces for trans people as possible in Poland as more and more people are coming out and need their families, peers and psychologists on their side. When it comes to advocacy, our priority has always been gender recognition, as Poland lacks enormously in this field. We recently had our gender recognition legislation vetoed by the President and the veto upheld by the Parliament, which shows that we are dealing with a lot of opposition to our work and the needs of Polish transgender community. 3) Why did Trans-Fuzja want to become a member of IGLYO? When we became a member of IGLYO we wanted to be up-to-date with latest issues surrounding trans and intersex youth as we didn’t do much in this topic. Today we have one project dedicated to study the situation of trans youth in school, part of which was possible thanks to what we were able to learn from IGLYO as its member. Whenever it feels like things are getting tough, reach out to your community or look for a community whether online or in the offline world. We are here for you. Some of us have lived through similar struggles and we can help you thrive in this tough and seemingly unfriendly reality. Always remember that you are a wonderful and spectacular human being and don’t let other people tell you otherwise. Would you like to know more about Trans-Fuzja’s work? 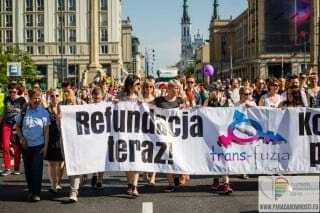 Trans-Fuzja marching at Warsaw Pride, photo courtesy of Trans-Fuzja and Parada Równości.